I know every non vegetarians like beef.I love it too. This is a tea time snack of beef and mashed potatoes.. 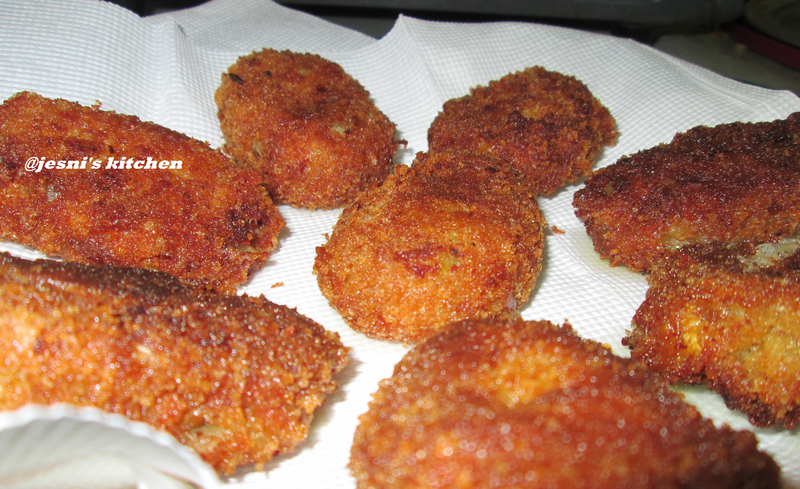 It has the goodness of egg too..Bread crumbs make the crunchiness, I here posting a simple way of making tasty cutlet... Just try it out..Kids will love it. For kids you can add little spice.. Serve then with sweet and sour tomato ketchup.. Enjoy the Recipe and give me feed back if any..
Cook the cleaned beef with 1 tbsp chopped ginger,1 tsp meat masala, ½ tsp pepper powder, salt and curry leaves. Once it is cooled mince the meat using a food processor. Sauté onion till it becomes soft. Add chopped ginger, green chillies and curry leaves. Add minced meat. Mix well. Add meat & garam masala. Saute the minced meat till it becomes dry. Allow the mixture to cool. Once it is cooled, add mashed potatoes & mix well. Make small balls with the mixture & roll into desired shapes. Beat the egg white. Dip each cutlet in egg white &then dip in bread crumbs. Deep fry in oil. Serve hot with tomato sauce and salad with hot tea enjoy!!! !.